After spending an hour getting your patio concrete smooth, the last thing you want is for someone to step right in the middle of it before it cures. 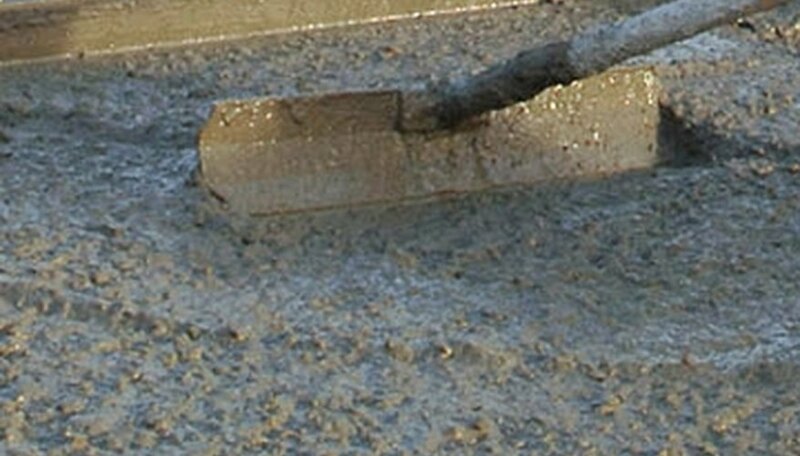 Unfortunately, children, dogs and even adults can mess up a wet concrete surface and then you’re working against the clock to repair it. Once damaged, it’s imperative that you fix the problem immediately. Your success depends upon how dry the concrete is when the damage occurs. Save a little pile of concrete if you have some left over. Many contractors order a little extra for such purposes. It will harden at the same rate or quicker than the actual pour but it comes in handy when someone steps into the wet concrete, creating a hole. Add a little extra when calculating your concrete needs. Shovel a little extra concrete into a hole and smooth it out with your trowel if the concrete is still soft. If there is no extra concrete, use only your trowel and puddle the hole and the adjoining area by tamping firmly to encourage the wet concrete to re-form. Use both hands on a flat trowel and work it back and forth firmly on concrete that is beginning to set. This is the worst stage for damage to occur and the repaired area may look slightly different from the rest of the pour when cured. Employ a push/pull technique. The easiest method is to kneel beside the damaged area and place the trowel sideways on the hole. Push it away from you, while tilting the handle towards you slightly. Pull it back while tilting it in the other direction. Continue in a vigorous motion to soften the concrete and bring moisture to the surface. Apply substantial pressure to the concrete when a deep scratch or gouge mars the surface and a crust has already formed on the wet concrete. Even though it appears to be hard, you may be able to work some of the moisture upwards with strong pressure. Work quickly to create friction. Use a light spray of water on the top of a concrete surface if it’s a hot and sunny day and only the surface of the concrete is curing. In this manner, you can slow the surface cure and complete your repair with a trowel. Place a large sheet of plywood on the surface of concrete that is beginning to cure to walk out to a damaged spot in the middle. Plywood distributes your weight evenly across the surface of the concrete and will not sink in. Take care not to let a corner of the plywood gouge the surface. You may use as many pieces as are necessary to make a path. Wait to re-broom patched concrete. If you broomed the concrete before the accident occurred, give the new patch a little bit of time to harden before you re-broom. Otherwise, you risk the patched area looking different when the concrete is set. Rope off wet concrete and keep pets away. It’s much easier to prevent damage than it is to repair it. The patched area may always look slightly different from the rest of the concrete. What Causes a Brand New Concrete Driveway to Pit?